Tire hardness has a huge affect on your car's performance. A tire too hard won't bite and a tire too soft may wear quickly or even ball up. Also tire hardness changes during its life cycle. To run your best you must keep track of all your tire's hardness's. This easy-to-use tool will help you do just that - quickly, accurately and easily. Interstate Pneumatics tread depth gauges is designed to measure tire wear in accurate increments. Features solid zinc construction and measures tire wear in 1mm and 1/32 in. increments. 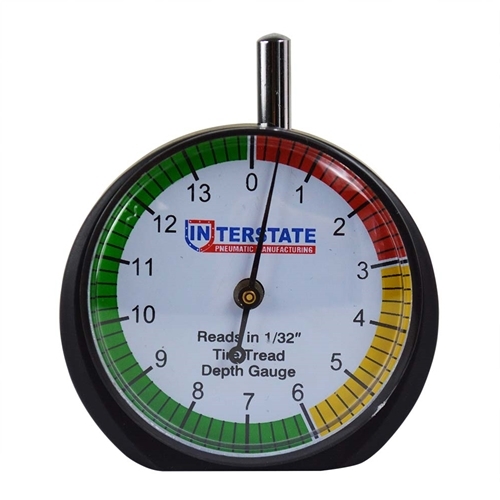 So put your change back in your pocket and pick up Intercomp Racing tread depth gauge for a better, more accurate read. 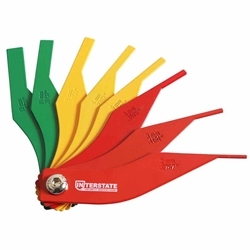 Use this Tire Thread depth gauge to guarantee that your complete tire patch has maximum track contact. 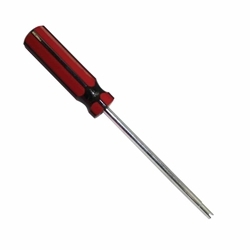 Interstate Pneumatics TCT1 4 Way Tire Valve Stem Core Remover / Installer / Repair Rethreader Tool. 4-way Tire Valve Stem Core Tool. Interstate Pneumatics TCT4 Tire Core Screw Driver 4"
Interstate Pneumatics TCT4 4 Inch Professional Tire Valve Core Removal Tool. Tire Valve Core Removal Tool is the one you'll see professional mechanics and tire technicians use to do the job right. Universal fit on all Schrader-type valves, which are standard on almost all air-filled tires on cars, trucks, trailers, ATVs, motorcycles, tractors, lawn/garden equipment, carts and most bikes (some road bikes with skinny tires use a taller & thinner valve called a Presta valve). The valve core is a critical component of your tires. It's a small metal spring-loaded device that fits inside the stem; it allows air in when you attach a chuck to inflate the tire and prevents air from escaping during normal operation. Removing/installing the core without the proper tool can easily damage the core and or stem inner-threads and prevent proper functioning - which means you either can't get air into the tire or the air leaks out. Interstate PneumaticsTCT4Tire Core Screw Driver 4"
Interstate Pneumatics TCT6 Tire Core Screw Driver 6"
Interstate Pneumatics TCT6 6 Inch Professional Tire Valve Core Removal Tool. 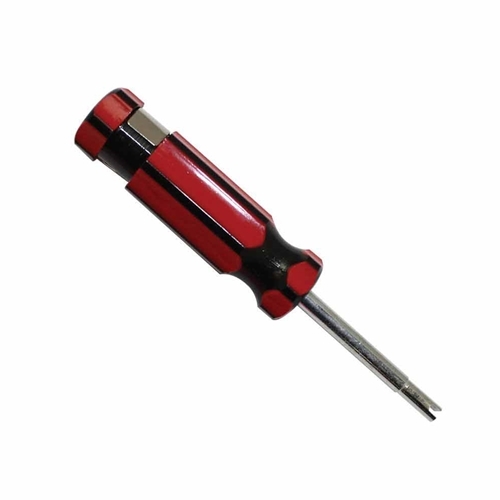 Tire Valve Core Removal Tool is the one you'll see professional mechanics and tire technicians use to do the job right. Universal fit on all Schrader-type valves, which are standard on almost all air-filled tires on cars, trucks, trailers, ATVs, motorcycles, tractors, lawn/garden equipment, carts and most bikes (some road bikes with skinny tires use a taller & thinner valve called a Presta valve). The valve core is a critical component of your tires. 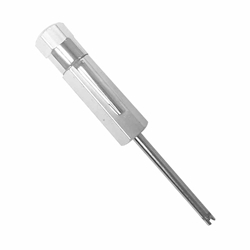 It's a small metal spring-loaded device that fits inside the stem; it allows air in when you attach a chuck to inflate the tire and prevents air from escaping during normal operation. Removing/installing the core without the proper tool can easily damage the core and or stem inner-threads and prevent proper functioning - which means you either can't get air into the tire or the air leaks out. Interstate PneumaticsTCT6Tire Core Screw Driver 6"
Interstate Pneumatics CH440 1/4" Industrial Steel Coupler x 1/4" Female NPT. The Interstate Pneumatics Industrial coupler features an easy-connect design in which you simply push plug into coupler to connect. 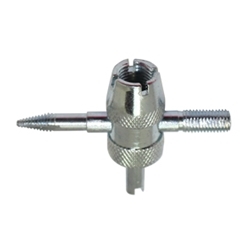 These couplers are interchangeable with the Industrial Standard series couplers produced by other manufacturers. Precision machined bar stock construction provides resisitance to the effect of mechanical shock in rugged applications.